On-line sites may not be booked more that 12 months in advance There is a $5.00 fee for on-line reservations. Cancellation must be made two (2) weeks prior to arrival date to receive refunds of amounts paid over the one non-refundable night. Only Camping Credits (vouchers), minus the one non-refundable night, will be given for cancellations made less than two weeks prior to arrival date. 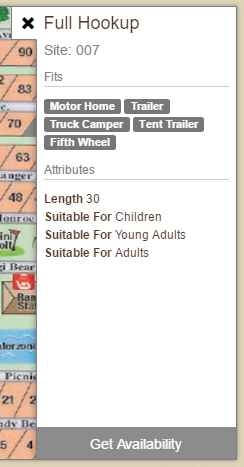 (Camping Credits expire 1 year after original reservation date, and cannot be used on holiday weekends or transferred). Solely CAMP GULF management determines Camping Credit and Refund requests. Request for special refunds or credits must be made in writing providing full proof of emergency circumstances claimed. All rates are subject to 11.5% Florida tax. Visitors will be charged $5.00 per person per day. Persons exceeding 5 per site will be charged $5.00 per person per day in the Spring and Summer seasons. Personal Golf Carts: You must register your golf cart upon check in. There is a $5.00 per day fee for your personal golf carts during Spring & Fall Break and Summer. It is also subject to our wheels rules. Tents are allowed in the upper park only. No reservations are made for tents. 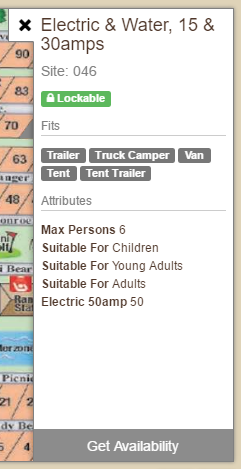 Tents pay full site price. Tents must be on concrete pad. Up to two tents and 5 people are allowed per site. No pets allowed for tent campers. Pet owners are required to sign a Pet Lease upon arrival - no pets allowed for Beach Front sites or tent campers. There are some “Pet Friendly” Cabins available.